Chakotay glanced at the chronometer. The captain had gone to her ready room about forty-five minutes earlier. He tugged his hear slightly as he made some final notations on the screen before he stood and headed for the door. He nodded slightly to Tuvok as he walked past him. "You have the bridge, Commander." Chakotay didn't signal for admission, he merely keyed in his code knowing Kathryn would be expecting him by now. He glanced at her on her couch as he made his way to the replicator. An empty cup sat on the table in front of her. "Good afternoon, Captain. Would you like more coffee?" Kathryn looked up from the padd she was working on. "Please. I was beginning to think you were going to leave me alone all afternoon." "You should know me better than that by now." Chakotay carried the cups to the couch and handed Kathryn hers. He sat down next to her, too close to be professional and not quite close enough to be personal. He sipped his tea before pointing to the padd Kathryn had been working on. "That the latest information on that red giant we passed this morning?" "Anything particularly interesting about it?" Chakotay's voice was polite but he was clearly not that interested in the star. "No. It's a perfectly boring, typical red giant." If her words hadn't indicated her boredom, her tone would have. Kathryn set her cup down and sighed in frustration. "How long are you going to do this?" Chakotay didn't even pretend not to understand what she was talking about. "I'm not sure. You held me at arm's length for more than five years. It's only been eleven months since you decided you wanted more of a relationship with me." "I don't understand how you can do this." Kathryn was clearly frustrated. "Why not? You did it for five years. I got very good at waiting, Kathryn. Now it's your turn." "You tell me, or ask me again in five years when I have as much experience as you do." "So do I." Chakotay's voice was deliberate and unemotional. "Then explain them to me." Chakotay let out a mental sigh. Finally, she had asked. It had taken eleven months, but she had finally asked. He nodded at Kathryn as he swallowed the last of his tea. "All right." Chakotay took his time gathering his thoughts. "Well, I'll start with the least important one since it's probably the easiest to understand. I'm human. It's not a particularly mature reaction, but I wanted you to have some idea of what those five years were like for me." "Revenge?" Kathryn sounded genuinely surprised. "Not exactly but if it suits you to use that term, I won't argue about it." "What is your other reason?" "I'm not sure you trust me." "How can you say that? You know I trust you with my life and my ship. I have since we first met." Kathryn's voice expressed her indignation unmistakably. "I don't mean that kind of trust, Kathryn. I don't think you trust me with your heart. You're afraid I'll leave or something will happen to me so you hold back." Chakotay turned to look at Kathryn. "I've waited for five years and I'll wait five more if that's how long it takes for you to trust me that way." "I don't know what to say." Kathryn sounded confused. "You don't have to say anything." Chakotay's voice remained composed. This was harder than he had thought it would be. "But how will either of us know?" Kathryn sounded very uncertain. "I'm not sure how we'll know, but I'm sure we both will." Chakotay smiled. "Will you at least trust me on that?" That brought a slight smile to Kathryn's face. "I can do that – I think." Chakotay sighed with relief. "Good. There's one more reason." "Oh?" Kathryn's expression changed from thoughtful to wary. "You sound like you think I'm not going to like this." "Not that so much that but it's going to sound a bit outlandish." Chakotay looked almost embarrassed. "On the positive side, I think we've made a lot of progress on this point." Kathryn stared at him but said nothing. "I think… thought… we needed to get to know each other better." Chakotay held up his hand as Kathryn started to protest. "I know. Just let me finish. "We're friends, good friends. But we weren't the type of male-female friends that we need to be for a long-term relationship. If we were twenty years younger and had just met, I'd have said we needed to date. Well, we aren't twenty years younger and we can't very well date on the ship so I've been coming in here to talk to you and work with you for the last few months. I feel like I know you a lot better now than I did a year ago. What about you?" Chakotay was watching Kathryn's face and knew that she had barely heard the last part of what he had just said. Kathryn nodded absently in response to his question as her words confirmed his suspicion. "You really want a long-term relationship? That's what this is all about?" "Of course I do. I love you." Chakotay studied her face. "If all I had wanted was to get you in my bed for a while, you'd have been there eleven months ago." "It hasn't felt much like love lately." Kathryn's tone was heavy with cynicism. "Well, I do." Chakotay paused. "Do you think I'd tell you I loved you in front of the bridge crew if you asked me?" "I believed that eleven months ago." Kathryn forced herself to meet his eyes. "Today, I'm not so sure." Chakotay nodded. "Would you have done it if I had asked you eleven months ago?" "Would you today?" He knew if she was not willing to consider it, that they probably had no future together. "You ask for a lot." Kathryn sat thinking for a long time. Chakotay was almost ready to pick up his padd and start working again, when she finally broke the silence. "If you need me to say it on the bridge, then I will." "Then let's go." Chakotay stood and picked up their cups and put them in the recycler then headed for the door. He turned to look at Kathryn where she was still seated. "Only if you're ready. It's up to you. I'll be on the bridge." 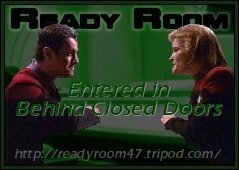 Chakotay exited the ready room and returned to his chair. A few minutes later, he heard the door of the ready room swish open. He listened to Kathryn's steps and only when he heard her coming down the steps did he stand and turn towards her. "Captain." Chakotay motioned toward the main screen. "We're on course at warp 6.5." "Very good." Kathryn turned to look at him. "Commander." Chakotay looked back at her. He knew everyone on the bridge was listening to them. Chakotay's heart pounded as she said the words. He looked at her and knew that what he was about to do was probably the hardest thing he would ever do. He reached up to stroke her cheek gently with his knuckles and allowed a slight smile to cross his face. "I'm glad you finally told me." He watched her face fall. "I'll be in my office working on this report if you need me." Chakotay stepped around Kathryn and strode up to the turbolift. The shock on the bridge was almost tangible. Chakotay ignored it as he deliberately made his way to the turbolift. Thankfully, the doors opened as soon as he approached. He stepped in and turned to face the door. As soon as the doors closed, he slumped against the wall and let out a breath he hadn't realized he'd been holding. It was a full minute before he gave his destination. By the time he reached his office, he was breathing normally and had regained control of his thoughts and to a lesser extent his emotions. Now the waiting began, the waiting to see what Kathryn would do. Chakotay tossed the padd on his desk and went to his replicator. He was tempted to request whisky but years of discipline and habit managed to stay in control and he settled for tea. He drank the first cup quickly hoping the soothing warmth would calm his nerves. He had just picked up his second cup when his chime sounded. Forcing himself to relax, he told the computer to admit whoever was at the door. He kept his back to the door as he sipped his tea. He knew from the silence that it was Kathryn. "Why did you do that?" Kathryn's voice cracked. "You humiliated me. You walked away from me!" Finally, Chakotay turned to face her. He looked her in the eyes as he spoke. "Do you still love me? Do you still want to be with me?" "Damn you!" Kathryn turned away from him but did not move towards the door. "Do you still love me? Do you still want to be with me?" Chakotay's voice was gentle but insistent. "Yes." Chakotay could barely hear what she said. "I said yes!" Kathryn turned as she shouted the words. "Gods help me, yes." Chakotay walked over until he stood only inches from her. "Can you forgive me for what I just did?" Chakotay's voice was soft now. He was finally letting his emotions show. Kathryn looked into his eyes and he knew she saw his sorrow, remorse and fear, and that in that moment she finally understood how much he loved her and how much the last year had cost him. "This is how you felt all those years." "I never realized…" Kathryn's voice faded. "I know… but can you forgive me?" "Do I have to answer you now?" "No." Chakotay's smile faded. The time for pushing her was behind them. Whatever happened now was her decision. "You never have to answer that question unless you want to." Kathryn nodded and studied Chakotay's face as she considered his question. Finally, she straightened her shoulders and raised her head. "Finish that report, Commander." She turned to leave but stopped in the door. "Chakotay, it's your turn. I'll be on the bridge… waiting." The doors of the turbolift opened and Chakotay stepped out onto the bridge to see the captain in her chair studying the main screen. The captain didn't turn to see who had come to the bridge but he could feel the eyes of every other member of the bridge crew focused on him. He hoped he was walking at his normal pace but he wasn't sure. He stopped next to her chair and waited for her to acknowledge his presence. "Do you want something, Commander?" Kathryn's voice gave no indication of her thoughts. "Yes, Captain. I forget to tell you something earlier." "I love you." Chakotay's eyes never left the captain's. Slowly Kathryn stood up and moved closer. "That was quite an oversight, Commander." "Yes, Captain, it was." Chakotay didn’t move. Finally the captain moved. Her right arm reached up to the back of his neck and pulled his head down. Her left arm met the right behind his neck as she kissed him. Chakotay's reaction was immediate and he pulled her body against his. Eventually they remembered they were on the bridge, and pulled apart. Kathryn smiled at Chakotay through her lashes and clasped one of his hands. She turned and started leading him towards the lift door. "Commander, you're with me." Kathryn nodded at Tuvok as she went up the steps. "Commander, you have the bridge. We'll be…." Kathryn's words trailed off as she tried to think of what to tell Tuvok. Chakotay was thinking faster and finished her statement, "…conducting surprise inspections of various departments." The turbolift door slid open and they entered before Tuvok could respond. He tilted his head and raised an eyebrow as he motioned to Ayala to relieve him at Tactical. "Yes, Captain. Inspections." The turbolift door slid closed. "I'll see that no one spoils the 'surprise'." Close this window to return to reading the entries for Behind Closed Doors.